Short term financing for acquiring & improving apartment buildings is a valuable commodity, and definitely not right for everyone. Apartment Building Fix & Flip Loans are one of our more specialized products, and require a qualified Borrower with the right track record & expertise to succeed. 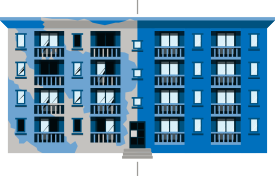 If you qualify, a 12 - 18 month apartment building fix and flip loan can be used to acquire, renovate, rehab, raise rents, and boost occupancy in apartment buildings ranging from 5 - 500+ units, from $250k - $250m+. The Apartment Building Fix and Flip Hard Money Loan rates & terms listed below are subject to change, and will not apply universally. These are just rough ballpark rates & an outline of the typical terms. Eligible Uses: Acquisition, Refinance, and/or Renovations. Loan Term: 12 - 18 Months. Max LTV (Purchase Price): 60% - 70%, with up to 90%+ for highly qualified repeat Borrowers. Apartment Building Fix & Flip Loans are one of our more specialized loan products. With this specialization comes higher barriers to entry as a Borrower when compared to simpler Single Family Fix & Flip Loans or 2 - 4 Unit Fix & Flip Loans. As mentioned above, and in common with all our Fix & Flip Loans: apartment building fix & flip loans are going to be in the 12 - 18 month range at most. In some instances, it might be possible to extend this period (especially on larger loans and lower LTVs). Note: if you're considering refinancing once you've improved the property value & cashflow, check out our longer term, lower rate Buy & Hold Apartment Building Hard Money Loans. Our lowest balance apartment building loans will start in the $250k range (depending on circumstances & location). Except on multi-million dollar loans with highly qualified Borrowers, most of our apartment building fix & flip programs will require a max LTV in the 60% - 70% range. This means at the bare minimum, you'll need at least $75,000 - $90,000 cash at closing (ballpark estimate on a $250k loan @ 70% LTV). The good news is track record & collateral are much more important than credit scores for Apartment Building Fix And Flip Loans. Finally, for repeat clients, there is even the possibility of using a no- or low-doc program even on $1m+ transactions for 5+ unit apartment building flips. There are a variety of scenarios where it makes the most sense to take advantage of an Apartment Building Fix & Flip Loan. Apartment Building Fix & Flip Loans are short-term. You'll need to sell or refinance within 12 - 18 months in nearly all cases. If you're looking for more permanent financing on an apartment building, consider a longer term Buy & Hold Apartment Building Hard Money Loan. For apartment building fix and flips, the property must be 5 or more units. We have other loan products for Single Family Fix & Flips or 2 - 4 Unit Fix & Flips. Finally, to qualify for an apartment building fix & flip hard money loan, you'll need to have a viable exit strategy. Knowing your plan, and being clear in articulating it will be crucial in securing your financing. If you can focus on the above 3 factors, and are confident that you're ready & qualified for the deal, then private hard money can be a highly profitable choice when it comes to securing an Apartment Building Fix & Flip Loan. Our goal with a 5+ unit apartment building fix & flip loan is to be the key to opening up new wealth building opportunities & multi-million dollar ROI for your real estate business. We are always looking to fund apartment building acquisitions, so if you are a qualified borrower with any questions, please contact us so one of our friendly, US-based financing specialists can help evaluate your deals and provide a personalized rate quote. For All This & More, Get The Borrower's Guide Now.